When you think about America’s national parks, what probably comes to mind first is America’s first national park – Yellowstone. It's also the first national park in the world, established by Congress in 1872, even before the National Park Service was set up. Yellowstone sits on an active volcano, the source of the more than 10,000 geothermal features in the park, including more than half the world's geysers. National Parks traveler Mikah Meyer made sure he caught the eruption of the best-known of its 500 geysers - Old Faithful, which shoots a column of superheated water up to 42 meters into the air, every 60 to 110 minutes. 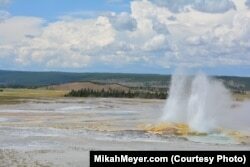 More than half the world's geysers are in Yellowstone National Park. "They have geysers that range from Old Faithful to these geysers that are basically holes in the ground that give a glimpse into what the bubbling boiling earth underneath is like." And some of what bubbles up is mud. Mikah describes these 'mudpots' as a witch's cauldron. "They look like some sort of witch’s concoction because you're just walking along this boardwalk and suddenly to your left and your right you've got these giant mud pools that are bubbling up in random spots, and so it really is a place where you can see the earth’s underbelly." The thousands of steam vents in Yellowstone give off a powerful sulfur odor. He noted a constant feature of the park -- steam. "Anywhere you are in the park it always seems like somewhere in your 360° view you'll see some steam rising out of the ground." These fumaroles, or steam vents, are the hottest hydrothermal features in the park, with temperatures as high as 138°Celsius. Yellowstone is also home to thermophile microbes, which thrive in the hot springs. Trillions of these microorganisms are grouped together, so they appear as masses of color. Since different types of thermophiles live at different temperatures within a hot spring, they produce what looks like a rainbow in the water. Grand Prismatic Spring is Yellowstone's largest hot spring. It's about 112.8 meters across and more than 37 meters deep. And it's not just hot water shooting up... Yellowstone also has 350 identified waterfalls that tumble down more than 4 1/2 meters. The Lower Falls of the Yellowstone River is the tallest cascade in the park. At 94 meters, it’s twice as high as Niagara Falls. Many of the more than 4 million visitors to Yellowstone each year come to see one of the symbols of the American West. Yellowstone is the only place in the United States where bison have lived continuously since prehistoric times, and the park’s herd of 4,000 to 5,000 animals represents the last-known wild bison population in the world. Before nearly being wiped out in the late 1880s, tens of millions of bison roamed across most of North America. Efforts to restore the population in Yellowstone began in 1902. Mikah said they really catch visitors' eyes. 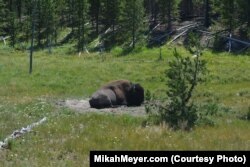 "I have this video of what I call a Yellowstone traffic jam which is basically anytime there's any sort of animal on the side of the road, everyone seems to stop their car and take pictures or pull over and it's an instant traffic jam!" 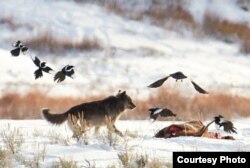 But bison aren't the only iconic animals in the park. Yellowstone is home to the largest concentration of mammals in the lower 48 states, including predators like grey wolves and bears, and large herbivores, like big horn sheep, elk and moose. There are nearly 300 species of birds, 16 species of fish, five species of amphibians, and six species of reptiles. But the main draw remains the regular eruption of Old Faithful. 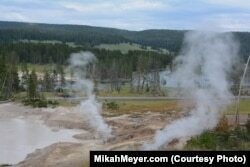 "If you're on the hunt for geysers," Mikah concludes, "you really can't do much better than Yellowstone National Park." Mikah invites you to follow him on his epic journey by visiting him on his website MikahMeyer.com, Facebook, Instagram, Twitter and YouTube.